Robots, not humans, will run the show. Artificial intelligences are about to get a place to call their own — and it’s located somewhere humans are unlikely to want to visit. According to a story published Monday in the South China Morning Post, scientists from the Chinese Academy of Sciences plan to construct a research base deep in the South China Sea, and they want artificially intelligent robots to run it. This base could be the “first artificial intelligence colony on Earth,” those involved in the project told the SCMP. The researchers will reportedly construct the base between 19,685 to 36,100 feet below the South China Sea’s surface, though they’ve yet to pinpoint a specific location. Cables running from the base up to a ship or platform will provide it with power. The base will have docking platforms like a space station. 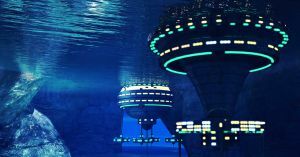 Robotic submarines will leave the base from these stations to conduct exploratory missions, surveying new areas and collecting data about marine lifeforms. They’ll also collect samples of minerals that the base will be capable of analyzing autonomously. Oceans cover more than 70 percent of the Earth’s surface, yet humans have only explored an estimated 1 percent of the ocean floor. That’s not entirely surprising though, given how volatile the environment can be. However, the benefits of knowing what’s going on deep beneath the ocean’s surface are plentiful — the insights gleaned from this research could improve our understanding of climate change, lead to the discovery of new medicines, or help researchers identify endangered species. So, while creating this “AI colony” won’t be easy or cheap — the SCMP reports it will cost $160 million to complete — the discoveries it could yield may make it well worth the investment.